Archaeologists have discovered the first physical evidence of cannibalism by desperate English colonists driven by hunger during the Starving Time of 1609-1610 at Jamestown, Virginia, the first permanent English settlement in the New World. There are 5 historical accounts written by or about Jamestown colonists that reference cannibalism, but this is the 1st time it’s been proven. Portions of the butchered skull and shinbone of a 14-year-old girl from England were unearthed by Jamestown archaeologists last year. They found the remains about 0.8 meters down in a 17th century trash deposit in the cellar of a building built in 1608 inside the James Fort site. Multiple chop and cut marks are found on the girl’s skull that were made by one or more assailants after she died. Four closely spaced chop marks in her forehead indicated a failed attempt to split her skull open. The close proximity of the unsuccessful blows indicates that she was already dead, or they would have been more haphazard. There were numerous cuts, saw marks, and gouges along her lower jaw made by the tip of a knife to get to the meat, and to remove throat tissue and the tongue. The girl's hair was not removed. The girl probably originated from the southern coast of England, based on a comparison of oxygen isotopes in her tooth and oxygen isotopes found in groundwater samples from the area. Although only part of the skull is still intact, researchers were able to produce a facial reconstruction by digitally creating a 3-D skull as is shown to the right. The girl may have arrived at Jamestown in August of 1609 on one of six ships from England that had survived a hurricane during their crossing. The new arrivals’ food stores were spoiled or depleted - most of their provisions were lost when the flagship Sea Venture shipwrecked during the storm - and many of them were in poor health. When the 300 new settlers arrived, having suffered from diseases and food shortages at sea, the Jamestown colonists were already starving due to increasing demands for food from nearby Indian tribes, coupled with severe drought conditions. 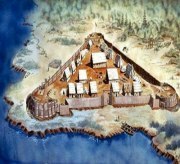 By November Indians were laying siege to Jamestown, cutting the colonists off from outside help. At first the settlers ate their horses, then their dogs and cats. Jamestown residents also ate rats, mice, and snakes. Some colonists ate their boots, shoes, and any other leather they could find. Others left the fort to search for roots in the woods, but were killed by the Indians. As the siege continued into the winter the famine increased and "nothing was spared to maintain life and to do those things which seem incredible, as to dig up dead corpse out of graves and to eat them, and some have licked up the blood which hath fallen from their weak fellows". How many of the dead were cannibalized is unknown, but the girl found by archaeologists was not an isolated case, according to historical accounts. The colony was saved that spring by the arrival of settlers who had been shipwrecked with the Sea Venture in Bermuda. They had built themselves a new boat and brought in much-needed supplies. They were followed soon after by Lord de la Warr, Jamestown’s first governor, who brought in additional supplies - a year’s worth - and even more colonists. Source: Neely, P.: Jamestown Colonists Resorted to Cannibalism, National Geographic. See also: Weebly.com.